Uncover exciting new photo and video opportunities with this exceptional super telephoto zoom lens featuring Nikon's Vibration Reduction (VR) image stabilization for blur-free results. Optimized for high-resolution DX-format DSLRs, it picks up where an 18?55mm kit lens leaves off and brings faraway subjects into close focus. Capture sports, wildlife, concerts, landmarks and more with phenomenal clarity and precision. Its superb optics and telephoto field of view produce beautiful portraits with softly blurred backgrounds, and its near-silent autofocus pulse motor (utilizing stepping motors) and VR make it a great choice for HD video recording. Bring your world within reach, blur-free. Uncover exciting new photo and video opportunities with this exceptional super-telephoto zoom lens featuring Nikon's Vibration Reduction (VR) image stabilization for blur-free results. Optimized for compact DX-format DSLRs, the AF-P DX NIKKOR 70-300mm f/4.5-6.3G ED VR picks up where your 18-55mm lens leaves off to bring distant action within reach. Capture sports, wildlife, concerts, landmarks - any faraway subjects - with phenomenal clarity and precision. But this lens isn't just about getting closer. Its superb optics and telephoto field of view produce beautiful portraits with softly blurred backgrounds. Add VR image stabilization and quiet autofocus pulse motor (utilizing stepping motors), the AF-P DX NIKKOR 70-300mm f/4.5-6.3G ED VR is an ideal choice for video recording and stills even when hand-held. The AF-P DX NIKKOR 70-300mm f/4.5-6.3G ED VR is a phenomenal second lens and picks up where your 18-55mm lens leaves off. Compact and lightweight yet with a powerful zoom, it will help bring the most distant subjects into focus. Capture stunning close-ups of sports, wildlife, concerts, school events and so much more. Unleash the potential of your camera's high-resolution sensor. 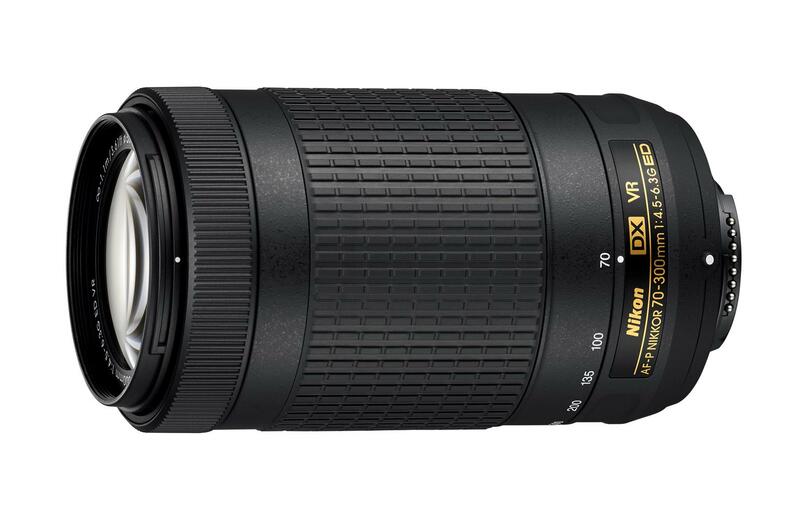 The AF-P DX NIKKOR 70-300mm f/4.5-6.3G ED VR features the superb optics and advanced technology used on Nikon's high-end lenses. Your photos and videos will have rich, vibrant colors, deep contrast, minimal distortion and beautiful soft backgrounds, even in less than ideal conditions. Nikon's Vibration Reduction (VR) image stabilization keeps photos sharp and videos steady when shooting hand-held. It also enhances your camera's low-light capabilities, allowing you to shoot at slower shutter speeds in dim lighting. Switch between Auto Focus and Manual Focus or turn VR on and off using the camera menu. With no switches on the lens barrel, you have no chance of accidentally changing settings when you want to take the shot. The AF-P DX NIKKOR 70-300mm f/4.5-6.3G ED VR uses a pulse motor (utilizing stepping motors) that focuses extremely fast and is nearly silent. Bring subjects into focus instantly with absolute precision. When recording video, smoothly shift focus from subject to subject with practically no drive noise.